The strategy consists of an ATM long call position and simultaneously an ATM short put position, on the same underline security, with the same expiration date. When we want to replicate an outright long stock position but without paying much money. The synthetic long stock strategy has the same risk profile and characteristics as an outright long stock position (see also the page ”put-call parity” for a better understanding why this happens). Maximum loss: Very high (until the stock goes to zero) + net premium paid (minus if earned) + commissions. Maximum profit: Unlimited to the upside – net premium paid (plus if earned) – commissions. Below we can see the profit/loss diagram for the synthetic long stock strategy which is just like an outright long stock position diagram. The strike price is $25, the call premium is $2 and the put premium is $1.50. 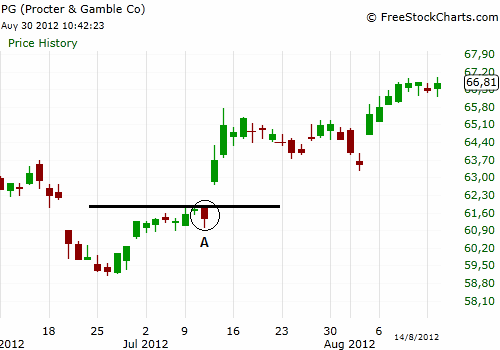 In the daily chart of PG (below) we believe that the stock will make a breakout above resistance, when it is at point A. The market is also in an uptrend and this fact augments the possibility of the breakout. 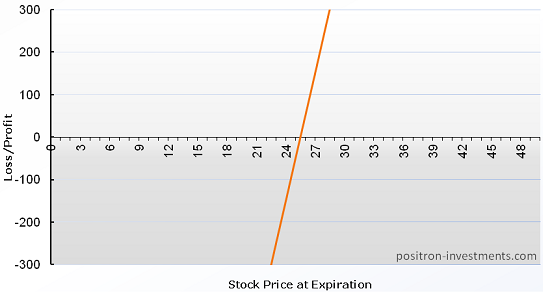 If we want to buy 500 shares of PG when the price is at $62 we have to pay $31,000 ($62×500). We open the options chain for the stock and we see that at the strike price of $62.50 and expiration after two months, the call premium is $3.50 and the put premium is $2. So instead of buying the stock we can replicate the position by purchasing 5 calls and simultaneously writing 5 puts. The strategy will cost us only $750 [($3.50-$2)x100x5], plus commissions.